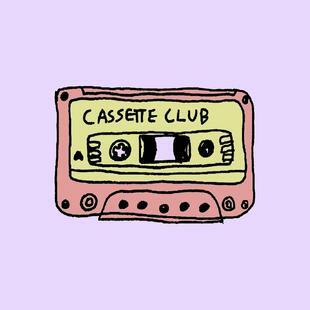 Earlier this month, Spirit Goth begun a collaborative project entitled, “Cassette Club”, a monthly cassette subscription of your favorite independent artists. February’s exclusive pressing, ‘Rarities’, is an assorted collection of beats and mixed by Josh Augustin, member of dream-pop group, Vansire. But I think I’m getting a little ahead of myself here. What exactly is Cassette Club? Upon signing up for membership, you will receive one tape every month, with shipments including All of Spirit Goth's upcoming tapes before they go public, exclusive Cassette Club tape pressings, special featured releases from other tape labels, and digital downloads. Through this, you’ll be able to discover new music and favorite artists from indie, lo-fi, bedroom pop, and dream pop for only $7 a month! With a limited run of only seventy-five tapes, Rarities will be Cassette Club’s second run, and features thirteen tracks ranging everywhere from the meditative energies of 'Moonlight’, to funky bass riffs in ‘All You Do’. This album encompass’ Josh’s personal work from the past years, featuring collaborations with rapper Chester Watson and a cover of ‘Beabadoobee’. In addition to the subscription, Rarities is also available for streaming on Spirit Goth’s YouTube channel. If you’re interested in joining the Cassette Club, you can do so at Spirit Goth’s site linked here. Be sure to keep up with all of Josh’s projects and pieces, with Vansire, solo work, and wherever the wind may blow!